AHI Records, distributed by BUYSOUNDTRAX Records, presents a special Collector’s Edition of PRINCE OF DARKNESS. The soundtrack features music composed & performed by John Carpenter (HALLOWEEN, ESCAPE FROM NEW YORK) and Alan Howarth (THE LOST EMPIRE, HEADLESS) for the 1987 cult horror film written and directed by John Carpenter, starring Donald Pleasance, Jameson Parker, Lisa Blount, Victor Wong, Dennis Dun, Peter Jason and Alice Cooper. PRINCE OF DARKNESS tells the story of a group of researchers who find a mysterious cylinder in an abandoned church in Los Angeles. Inside the cylinder is a mysterious green liquid. As the research team tries to unravel the mystery of the cylinder, strange events begin to occur around them. Their sleep is interrupted by strange dreams. Outside of the church, a crowd of homeless people begins to gather. And one by one, the team members begin to disappear… Released in 1987, PRINCE OF DARKNESS was largely misunderstood by both critics and audiences. But as time has passed, the film has developed quite a following with fans of the director and author H.P. Lovecraft, in part due to its emphasis on atmosphere and building tension as well as the film’s grounding in a reality of hard science, sprinkled with religious overtones. Alan Howarth, in addition to being a composer, is an accomplished sound designer and editor, having worked on films such as STAR TREK: THE MOTION PICTURE, POLTERGEIST, TOTAL RECALL, ARMY OF DARKNESS, BRAM STOKER’S DRACULA, STARGATE and many others. He has been a frequent music collaborator with John Carpenter on his films beginning with ESCAPE FROM NEW YORK in 1980 and including HALLOWEEN II, CHRISTINE, BIG TROUBLE IN LITTLE CHINA and THEY LIVE and Alan has scored many films on his own, including THE LOST EMPIRE, RETRIBUTION, HALLOWEEN 4 & 5, THE DENTIST and, most recently, HEADLESS and BOO!, for the SCI-FI Channel. PRINCE OF DARKNESS was released on compact disc at the time of the film’s release by Varese Sarabande and contained around forty four minutes of music. The soundtrack has been out of print in the United States for many years now and has only been available as a scarce European import. 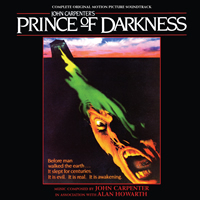 AHI Records, distributed by BUYSOUNDTRAX Records, presents a new Collector’s Edition release of PRINCE OF DARKNESS on TWO compact discs, including the complete score, as recorded for the film as well as the contents of the original album release, newly remastered, over TWO hours and twenty minutes of music. The booklet contains exclusive liner notes written by Alan Howarth himself. This is a limited edition release of 1000 units.